July is National Ice Cream Month! In fact, today is National Ice Cream Day! What better time to finally tell you about the Ice Cream Parlor Birthday Party we threw for Grace's 2nd Birthday. Yes, I know, I already told you about the Sesame Street Party we had for her 3rd birthday! Somehow, until now, I lacked the motivation to tell you about this perfectly delicious party. Throwing an ice cream party was actually Joe's idea. While we were putting the finishing touches on the Sweet Shop we put together for Grace's first birthday, he commented on how fun the same concept would be with ice cream. I love love love ice cream, so I was totally on board with the idea! Then, for Christmas that year, my parents made us a fabulous gift basket with all sorts of goodies and the cutest ice cream dishes tucked inside. They didn't know of our plans of throwing an ice cream bash, but knew how much I love little dishes...and of course, polka dots! I love love love polka dots! Almost as much as ice cream! In addition to the colorful, ceramic dishes from my parents, I picked up some clear glass milkshake glasses, sundae dishes and banana split boats. I lucked out finding them on sale at the craft store. I didn't go crazy with decorations for this party since I really wanted to focus on having a variety of sundae toppings for our guests. 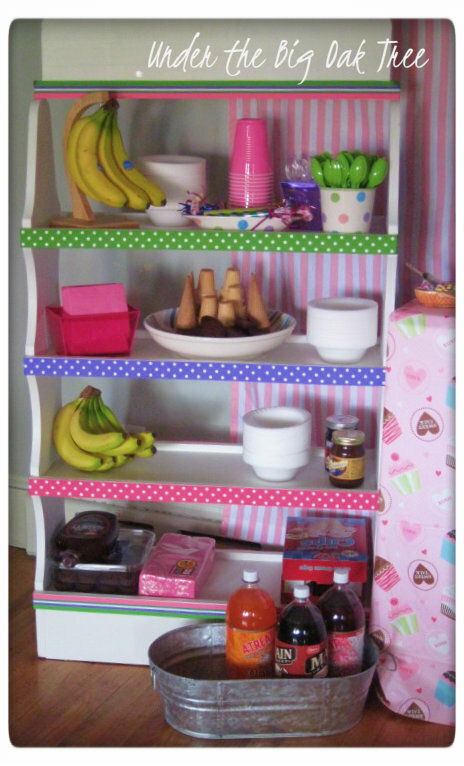 I did want to make a backdrop for our sundae buffet, but had a difficult time finding a striped fabric that I liked. As time was running out, I found a set of pink and white tab-top curtains (on ebay) that worked perfectly! My absolute favorite detail of the party was the invitation. 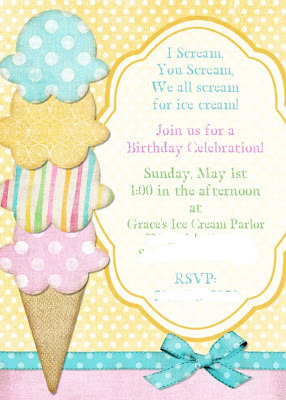 For Grace's 1st and 3rd birthdays, I made the invitations (you can see them here and here), but I ran out of time in planning her 2nd birthday and needed to purchase invitations. I knew just where to look, too! Bear River Photo Greetings is an Etsy Shop that I've been using for a few years. 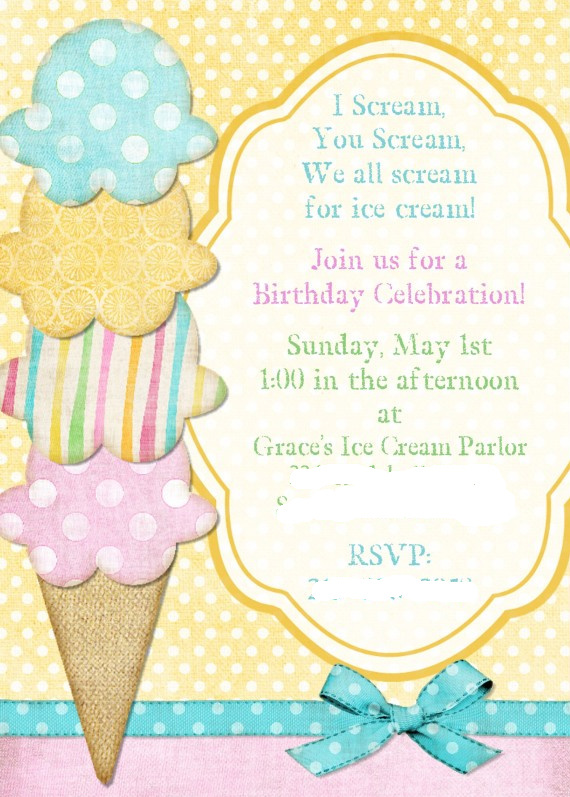 I told my friend Angie what I was looking for and she came up with the most adorably perfect invitations for Grace's party! (For privacy's sake, I "erased" our personal information on the invitation.) All I had to do was upload the file to and send to our local photo printer (CVS, Walmart, etc.) and have them printed super-quick using the one-hour option! Adorable and convenient, too! Ordering these invitations* saved me a lot of time and aggravation! With the invitations sent out, all I had to do was gather the assortment of toppings needed for our sundae buffet. On the day of the party, I covered a narrow table with a vinyl table cloth and then set out our toppings: chocolate sprinkles (jimmies in my neck of the woods), rainbow sprinkles, shredded coconut, mini marshmallows, candy coated chocolate pieces, maraschino cherries and whipped cream. Plus a variety of sauces: hot fudge, caramel, strawberry syrup and chocolate sauce. We even had bananas in case anyone wanted to make banana splits and brownies for brown derby sundaes (my favorite)! Root beer, orange and cream sodas were available for floats as well as cones for something a little more traditional! After our guests enjoyed lunch, we set out all the tubs of ice cream on the dining room table. 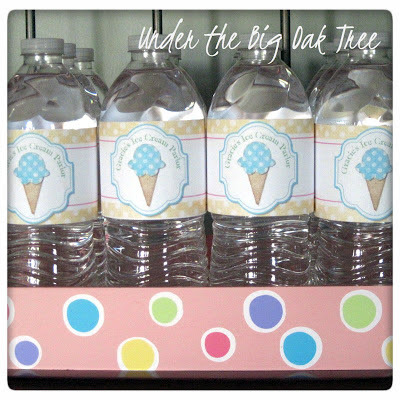 Though I didn't get a photo, we offered a variety of different flavors so there was something for everyone! 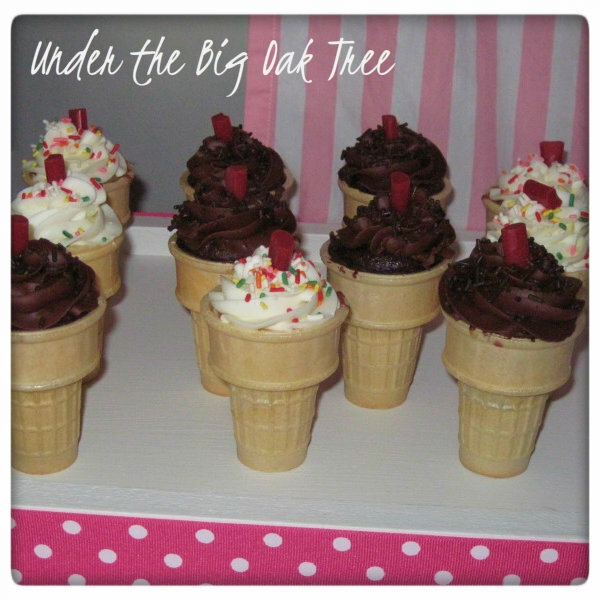 Since I love cupcakes just as much as polka dots and ice cream, my niece made some yummy ice cream cone cupcakes complete with sprinkles and a cherry (licorice) on top! 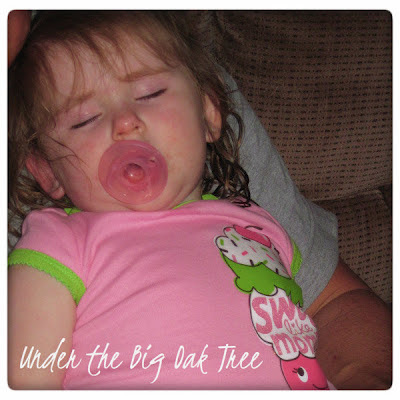 Even her pajamas matched the party (thanks to Grace's Aunt Barb)! I sure do love a party with a theme! So, how are you celebrating National Ice Cream Month?? What's your favorite ice cream flavor? *Note: The invitations in this post are not available for sale by Bear River Photo Greetings. These were made for me at no charge as a favor from a friend. Bear River Photo Greetings offers a wide range of other great designs for a variety of different occasions! Beautiful party. I just love the shelf with the polka-dot ribbons on the edges - adorable. Thanks for the fun inspiration! Thanks for posting this on Saturday Show and Tell. I hope you'll be back again this week!